The SK8070 is crafted with a stylish metal frame that enhances any room. 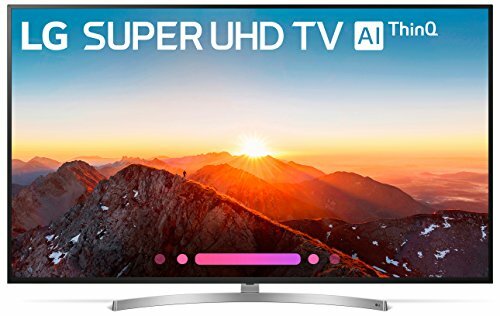 This new LG SUPER UHD TV with AI (Artificial Intelligence) ThinQ becomes the hub for the smart home: Using Intelligent Voice control, speak into the LG Magic Remote to pull up family photos, control light settings, check the weather and more. The α7 (Alpha7) Intelligent Processor works in tandem with the Nano Cell Display to deliver truer colors, deeper black levels and a wider viewing angle, while the local dimming backlight reveals a remarkably accurate picture with dazzling 4K detail. The SK8070 features comprehensive support of major 4K high dynamic range formats including premium Dolby Vision, as well as HDR10 and HLG.